During Black History Month, we celebrate Yarrow Mamout as one of the first property owners on what is now Dent Place in Upper Georgetown, one of the first investors in the Bank of Georgetown, and one of our nation’s capital’s most notable residents. Sheltered in the shadows from an August sun, a small crowd gathered amongst covered archaeological test units on an empty, privately owned lot in Upper Georgetown (Washington, D.C.) to offer Yarrow Mamout a proper funeral on August 14, 2015. 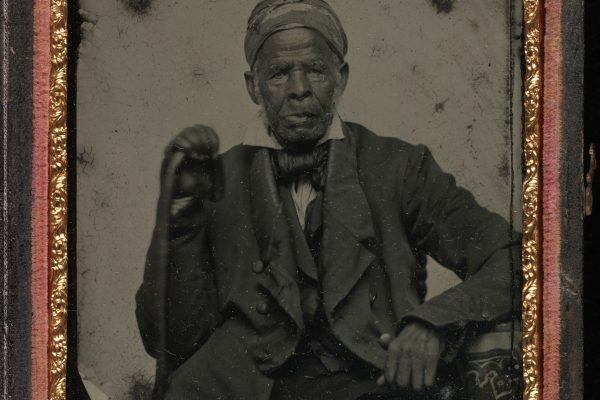 Mamout was an emancipated African Muslim who had gained notoriety in the early 19th century after sitting for two formal portraits, a rare occurrence for a person of color at that time. Though archaeologists would not break ground until June 2015, the Yarrow Mamout Archaeological Project was initiated in 2012 by James H. Johnston, who was concerned that the historical integrity of Mamout’s property was at risk of being destroyed to private and/or commercial development pursuits. Others in the neighborhood joined Johnston in pushing for the city to conduct archaeological investigations. The same year Johnston notified City Archaeologist, Dr. Ruth Trocolli, of the threat to Mamout’s property, he published “From Slave Ship to Harvard: Yarrow Mamout and the History of an African-American Family”, to date it is the only comprehensive reconstruction of Mamout’s life. During Black History Month, we celebrate Yarrow Mamout as one of the first property owners on what is now Dent Place in Upper Georgetown, one of the first investors in the Bank of Georgetown, and one of our nation’s capital’s most notable residents. Though not much is known about his early life, it is believed that Mamout was born ca. 1736 in or near what is present-day Guinea in West Africa. By this time, Islam had become a major factor in West Africa, and historians estimate that Muslims comprised between 10 and 30 percent of the enslaved population. Mamout was one of an estimated 600,000-1.2 million African Muslims who were forcibly taken from their homelands and enslaved in the New World. A sizeable portion of this population was, in many cases, urban, well-traveled, literate, and at the very least bi-lingual, speaking Arabic and their native tongue. In Islam, literacy in Arabic is of primary importance because its believers rely not only on the Quran to understand the religion but also to guide them in their daily life; provide them with the right prayers for different circumstances, and to instruct them on legal matters and proper social behavior. We know that Mamout knew Arabic, because he signed the deed to his property in it when he purchased it from Frances Deakins on February 8, 1800. Mamout arrived in Annapolis, Maryland on June 4, 1752 aboard the Elijah, where he was purchased by Samuel Beall, a wealthy landowner in Montgomery County, Maryland, to serve as a body servant. The Beall family was influential in the development and founding of Georgetown. When Beall died in 1777, Mamout was bequeathed to his son Isaac, but eventually became the property of Beall’s other son, Brooke. Around 1788 or 1789, a year or two after Mamout’s son Aquilla was born to an enslaved woman on a neighboring farm, Brooke Beall moved his family and slaves to Georgetown, where Mamout was loaned out several times. Mamout was a skilled basket-weaver and brick maker. Once he was emancipated, he used his skills to earn enough money to save $100 twice, which he lost to the actions of two merchants. He later saved $200 and became one of the first investors in the Columbia Bank of Georgetown. Around 1796, Beall told Mamout he would free him with the condition that he would make bricks for Beall’s new housing in Georgetown. Unfortunately, Beall passed away before he could free Mamout. Fortunately, Beall’s wife, Margaret, followed through, and Mamout was freed officially on August 22, 1796, several months after he had purchased his son’s freedom. Four years later, Mamout purchased what is now 3324 Dent Place, N.W.. The 1800 census listed Mamout and another person, likely Aquilla, as living on the property, which was then valued at $30. In 1803, Mamout transferred the property deed to Aquilla, who at that time was 15, so that it could not be seized by creditors (1). By 1818, the property was assessed at $500 and noted a small frame structure. Though the original deed has been either lost or destroyed, a deed book kept by the Recorder of Deeds exists and is housed at the National Archives. That man was Yarrow Mamout. Peale met and painted Mamout over the course of two days, during which he recorded his story in his personal diary. Curious about his life, Peale sought out Margaret Beall, who confirmed much of what Mamout had told him. Mamout is depicted wearing a blue coat with shiny brass button, a heavy overcoat, a knit cap, a bright red scarf, smiling slightly. The portrait is a rare early portrayal of a free African and the earliest known painting of an American Muslim. Upon completion of the portrait, Peale returned to Philadelphia and hung it in his museum, where it adorned the museum’s walls along with George Washington, Thomas Jefferson, Benjamin Franklin, and others. According to Stephan Salisbury (2011), after Peale died in 1854 his museum holdings were liquidated and the Mamout portrait was purchased by Charles S. Ogden, a prominent Philadelphia Quaker and businessman. For nearly a century, Mamout was not correctly identified because the portrait was unlabeled. In 2001, the portrait was transferred to the Atwater Kent, along with nearly 10,000 other historical artworks and artifacts. Mamout was largely forgotten, until James H. Johnston happened to walk past a second portrait of Mamout in the Georgetown Public Library in 2003 or 2004. This portrait was painted by the 18-year-old James Alexander Simpson in 1822, a year before Mamout’s death. Simpson’s portrait depicts a slightly older Mamout wearing a red, white, and blue knit cap, a white shirt, a red vest, and a blue coat while holding a tobacco pipe. It is an interesting thing, this obituary. For one, it was rare that an African American would have an obituary appear in a newspaper. Second, it was written by a prominent member of society, and depicts Mamout as an honest, moral, and industrious man. What is most interesting about the obituary, in an archaeologist’s mind, is that Peale, who was in Philadelphia at the time of Mamout’s death, writes that he was interred in his garden where he was known to pray. For over two hundred years, whether Peale’s claim was true or not, remained a mystery. Despite an intensive archaeological investigation of Mamout’s former property, the archaeological team, consisting of Dr. Ruth Trocolli, Chardé Reid, Charles Lee Decker, Dr. Muhammad Fraser-Rahim, and myself, conclude that we have found no definitive proof of Mamout’s occupation of the site in the archaeological record. Despite this, Mamout’s legacy lives on. The team participated in a Ṣalāt al-Janāzah, a ceremonial funeral prayer, conducted by members of the Islamic faith to seek pardon for the deceased. Coordinated by the Masjid Muhammad, the Nation’s Mosque, the ceremony was attended by nearly 100 people of various ethnic, religious, class, and educational backgrounds. For many, it was the first time they had learned about enslaved African Muslims and the first time that they were able to stand in unison to celebrate the life and legacy of Mamout with African American Muslims. 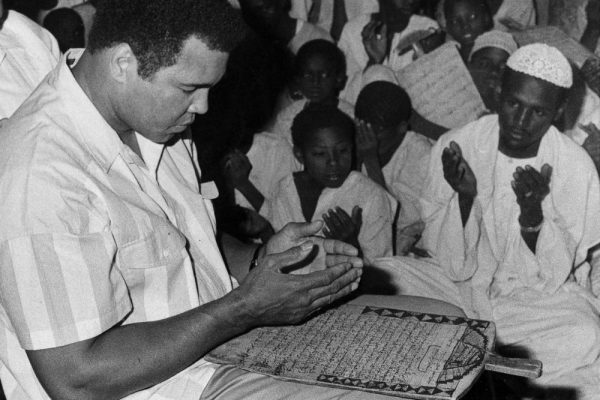 For those in the contemporary African American Muslim community, it was an opportunity to be visible. Contrary to popular belief, African American Muslims, not immigrant Arab/South Asian Muslims, laid the foundation for Islam in the United States, first as enslaved persons, and then as a means to cope with white oppression in urban, northern communities after the Great Migration in the first quarter of the 19th century. Let us remember Yarrow Mamout, not only as a great man and local celebrity, but as a gentle reminder that this land was made for you and me. Johnston, James H. 2012. From Slave Ship to Harvard: Yarrow Mamout and the History of an African American Family. New York: Fordham University Press. Salisbury, Stephan. 2011. Peale’s 1819 “Mamout”. October 23. Accessed November 29, 2016. www.philly.com/philly/entertainment/20111023_Peale_s_1819_quot_Mamout_quot).html. Dr. Mia Carey is an historical archaeologist based in the greater Washington D.C metro area. She was a former field director for the 2015 Yarrow Mamout Archaeology Project. Dr. Carey is currently the National Park Service’s Mellon Humanities Post-Doctoral Fellow in the Legacy of the Civil Rights Movement.